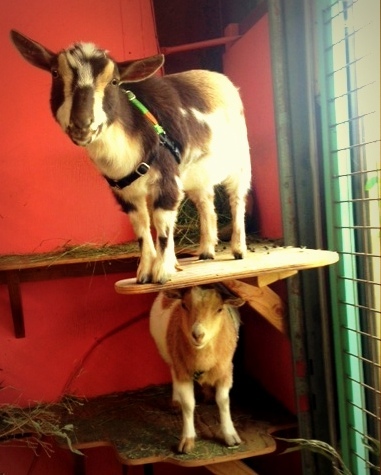 Oona Bee Riot & Binga Von Flair - Naomi's goats are often home in their timber bamboo forest and on hiking adventures. They come to work with Naomi once or twice a week and hang out 'n chew the cud next to the registers. You're welcome to call ahead to check if they're in or when they may be next. 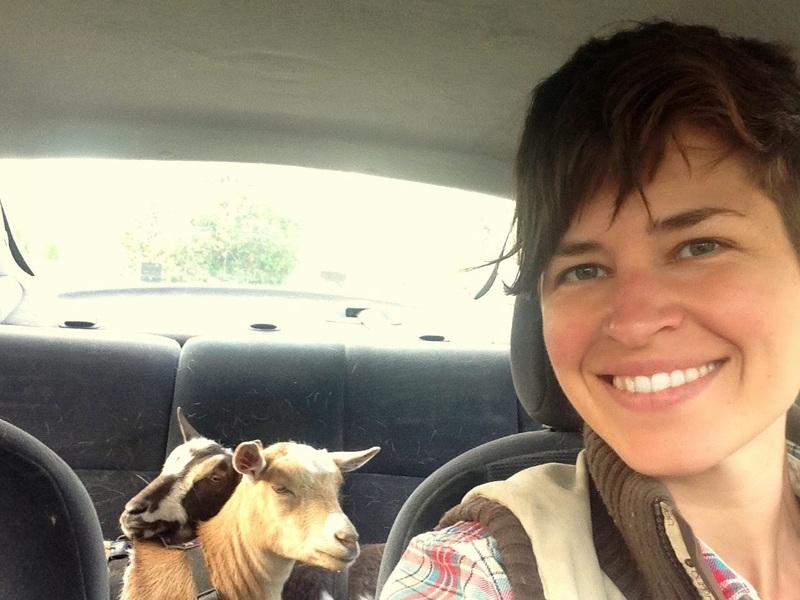 They are from an excellent dairy herd, Quail Run Hollow, in Gaston, OR. 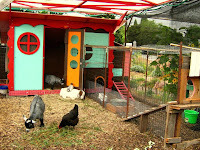 Visit QRH by appointment for goat and cheese-making classes, baby goats kids and their cheese while in beautiful wine country, find more on their website. Your goats will generally need an annual CD/T booster (prevention of Tetanus and Enterotoxemia) and definitely need BoSe (Selenium and Vitamin E) injection annually or you can administer at home with a gel, we carry 80ml tubes and dose is generally btw 2 - 4 ml on a more frequent or monthly basis. It's very easy to mix in with treats and it's a great value. We also have goat specific probiotics, electrolytes and a lot of first aid kit supplies. These vets are compiled from our customers, please let us know if you have a good or bad experience at one or find a particular vet or clinic we should add to the list. Edible vs Poisonous Plants: Make sure to have printed plant list on hand as reference and share with your family, friends and neighbors - here is one source - http://fiascofarm.com/goats/poisonousplants.htm. HAY: Compressed Orchard, the most popular with goats, Timothy and Alfalfa. We also stock non-compressed Orchard. Currently out of certified organic hay and on the search for manageable organic bale sizes. 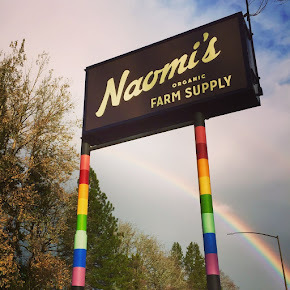 MINERALS: Redmond Goat Mineral, Fertrell's Premier Goat Minerals, Kelp Meal, Sodium Bicarbonate / Baking Soda, Azomite Trace Minerals, Dolomite 10AG, Redmond Organic Trace Mineral Salt: loose, rocks and blocks & Fertrell's Yeast (non-gmo and on grown organic alfalfa base). Feed Sulfur, Sweetlix Caprine Milk Bird Brains & Chicken Butts Minerals and Diamond yeast by special order. Barley, Non-gmo Camelina, Linseed Meal, Rolled Oats, Rolled Barley, Black Oil Sunflower Seeds. Other feed ingredients by special order. BEDDING: Certified Organic Oat Straw and Compressed Non-og Wheat Straw Bales. Cedar and Pine Shavings, Cedar Toe Bales, Dry Den wood bedding pellets with zeolite, Stall Dry and Lime. BARN: Water buckets - black rubber or plastic in colors, Rubber feed tubs, hoof trimmers, milk filters, mineral tubs and other barn goods. We are working on some custom hay and mineral feeders. 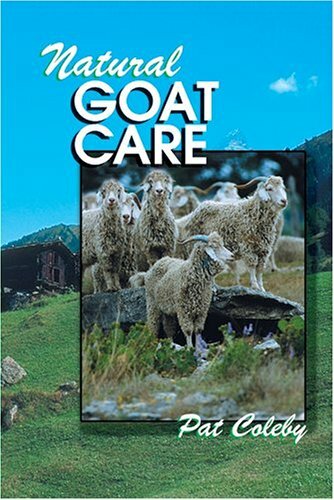 BOOKS: The Backyard Goat, Storey books on Miniature Livestock & Dairy Goats, City Goats, Natural Goat Care, plus Cheryl K. Smith's books coming soon and many other books on multiple animals, fencing, barn building, cheese making and soap making. Let us know if there are other goat items you'd like.